The brutal frogs are a lot like the angry birds! Both are bent on revenge, the difference is the frogs have decided to exact their revenge on the angry birds. Evolution stacked the odds in favor of the angry birds but as we all know the evolutionary cycle has its perks and these frogs have evolved into very efficient bird hunters... In this action packed IOS game you will take the side of the frogs and wreak havoc, mayhem and destruction on the angry birds habitats destroying as many birds as possible along the way. 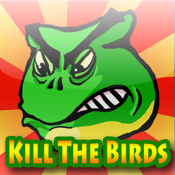 ★The Angry Frog will explode when you tap the screen and kill all the birds around him. ★The Parachute Frog can land almost wherever he wants, close to the dumb birds. Just tap the screen to release the parachute. ★The Tongue frog uses his tongue as a liana and can really getting close to the chicken birds. ★The Lady Frog places a bomb carpet over the birds nest, very impressive. The day of the frog has arrived!